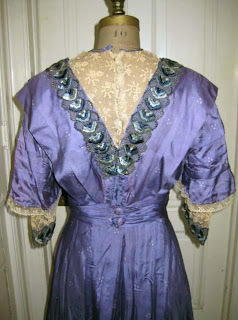 Silk color is what I would call an indigo blue with a hint of denim color, some pics are reading too violet or dark on my monitor. 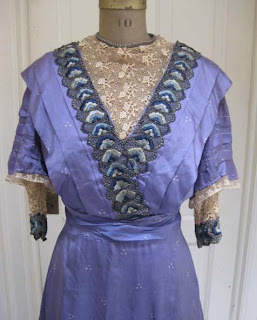 A fantastic antique, late Victorian / early Edwardian, blue print silk dress with ecru embroidered/patterned lace at neck, back & sleeves enhanced even more with richly colored (blues family colors) 2-1/4" wide metallic trim at top front & back V and at sleeves. Neck & center sleeve trim is a braided blue & metallic narrow trim. 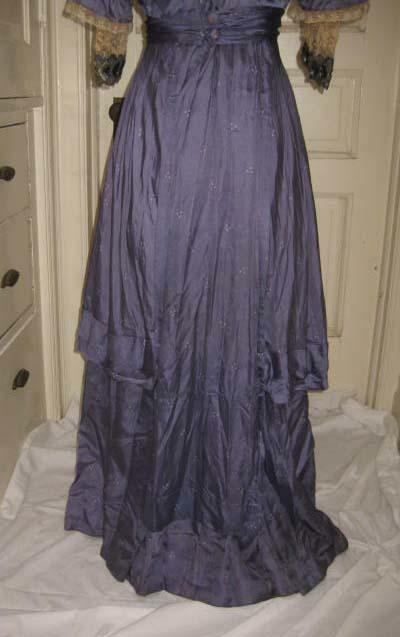 Fantastic 3 layer length skirt with long narrow front & back panels, below knee side length and of course full length underskirt. Blue silk has a petite triangle shaped ivory print. 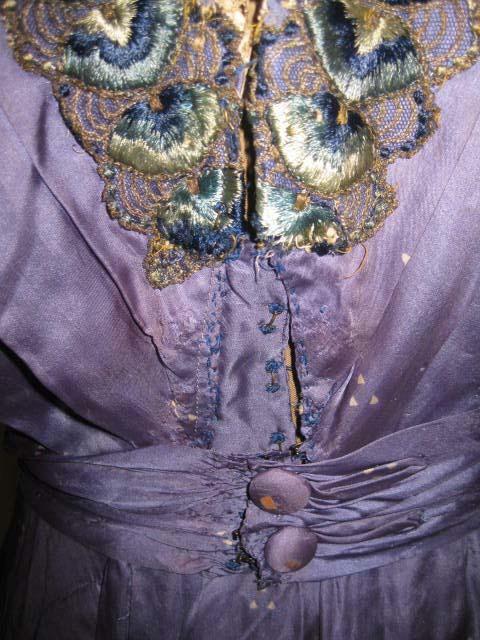 Cumberbund attached at waist with 2 covered buttons in back. Hook/eye & snap closures. Lined in a cotton. 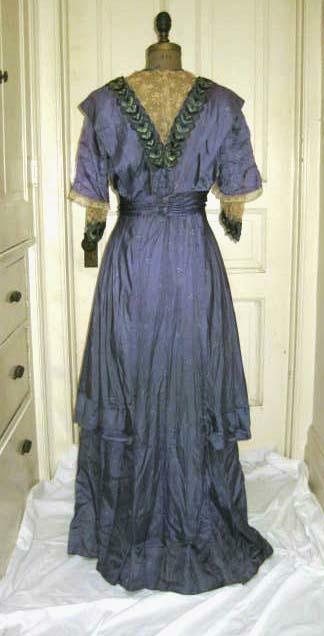 No boning or severe Victorian structure, this dress must have felt liberating to wear at the time. 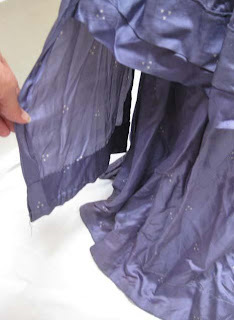 Long underskirt finished at inner bottom edge with a good strong twill tape & shows minor wear. Shorter skirt elements are weighted at hems so it hangs properly. Covered buttons on cumberbund worn & the lower back / waist has been extended at some time, looks like to me, see pic. No other alterations that I see. 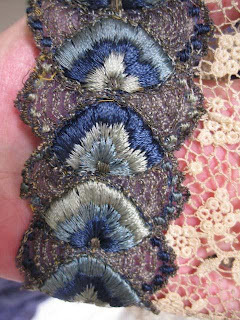 Lace in very good condition with some minor loose spots I would guess however I didn't find any. Embroidered metallic trim BEAUTIFUL, sets off the dress in general combined with the patterned lace. 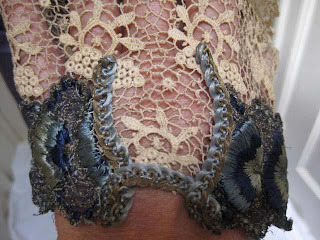 Delicate lace edge at silk sleeve bottom looks handmade & in beautiful condition. 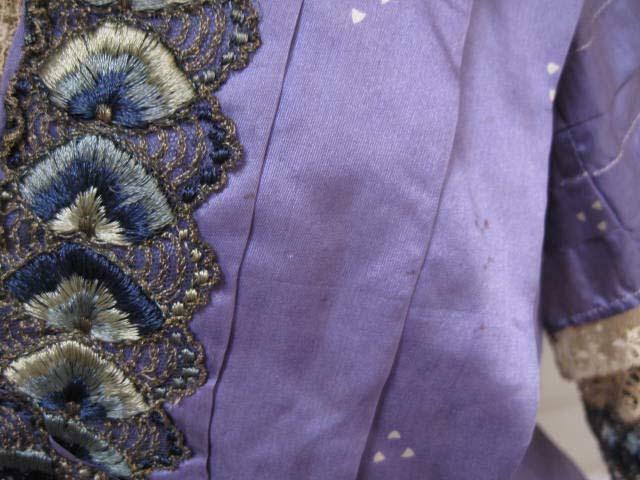 A scattering of tiny holes in front skinny dress panel, see pic, really not noticeable when worn since there is an underskirt of the same fabric. 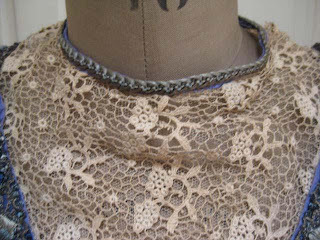 A few small holes from hook placement at back, generally covered by the cumberbund. Some scattered spotting on silk, have shown most obvious in pics. Pit staining, see pics, is actually worse in pics than in hand. Some general silk fading (seen when you turn back a neck pleat) but not really bad & the color is still very pretty. No obvious spot fading (other than pits). 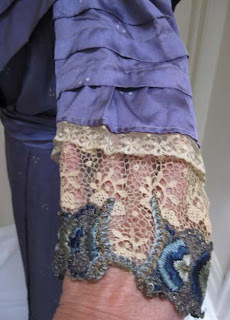 Some hem stitching/securing needed. 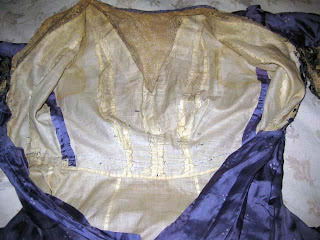 No obvious silk splitting, a couple of small tears in cotton top lining. 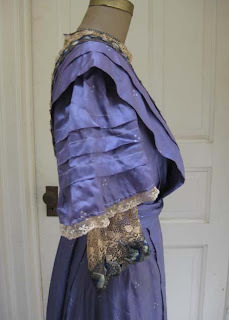 Silk is wrinkled a bit and I have not had the dress cleaned, will leave that decision to the new owner. No size but this dress is a small to maybe small / medium size, however please use the following approximate measurements as it is not returnable due to size. 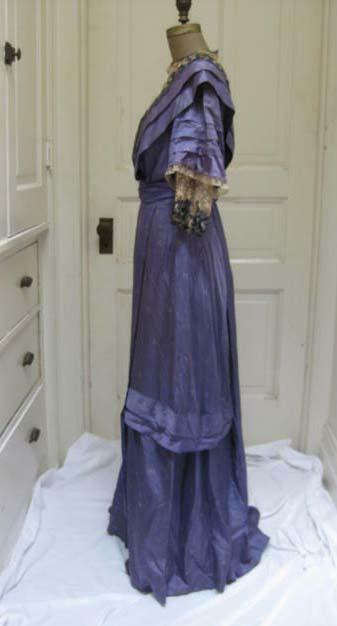 It is shown on an antique small size mannequin (33", 25", 34-1/2") & fits a bit loose. 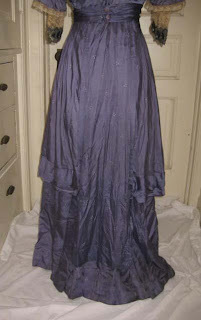 waist 24" extended to approx. 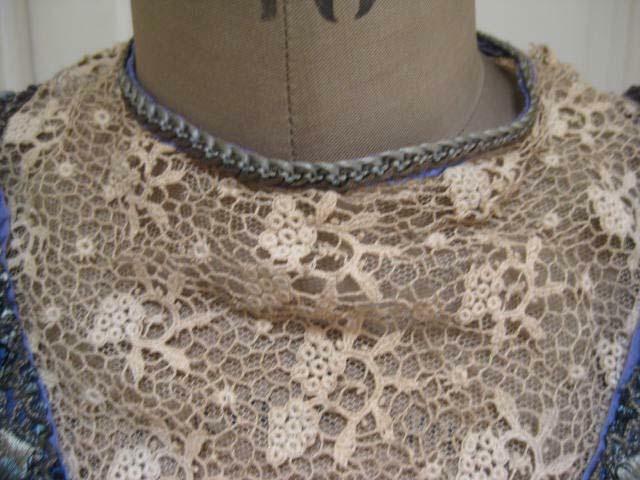 26"
length from center front neck seam 56", skirt 40-1/2", top 15-1/2/16"
sleeve length from shoulder 15"
Please ask if you need further measurements and remember some adjustments can be made. 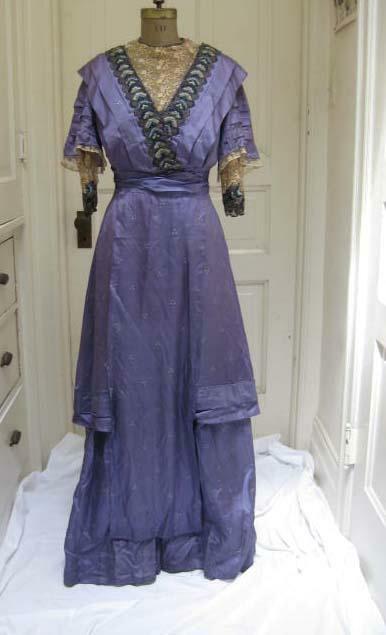 This dress screams 1910. The neckline, the sleeves, the trim placement - just do a search for 1910 fashion plate and you will see each of these elements.